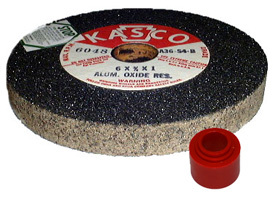 Our bench grinder wheels are resin bond aluminum oxide designed for general purpose shop work. They are more rugged than vitrified wheels and rated for higher speeds. For larger sizes up to 14" x 2" or for silicon carbide wheels, Email us. Contact us for larger size T-1 straight sided grinding wheels up to 14" diameter.